URC offers a family of premium Total Control user interfaces, advanced system controllers, multi-room audio technology and lighting control. These products work together to form the technology ecosystem of your custom-programmed smart home solutions. Control your entire home with elegant tabletop controllers and in-wall touchscreens – plus legendary URC handheld remotes, keypads, mobile apps and intelligent voice control. Control entertainment plus smart home devices. MX HomePro is designed for today’s connected generation. It melds seamlessly into your unplugged life – at home or on the go. Experience one-touch entertainment control. The legendary Complete Control line delivers reliable, single-room entertainment control via handheld remote or mobile app. URC designs, engineers and manufactures control solutions for subscription broadcast providers and electronics companies. 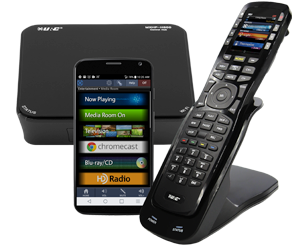 Your cable remote may be a URC remote!